At this stage of finishing, I just can't help fitting the almost done (but oh, so many days to go) guitar in it's case to come. Maybe it's the odd pieces of wood coming together as one, meaningful (and substantially bigger) piece of wood. Maybe it's just looking at the beauty of a traditional shape, reproduced and interpreted once again. One of the reasons I so much love this craft is looking at the guitar. Of course it's about sound and music, but also looking at and holding the instrument. Even smelling it (therefore, I prefer spanish cedar for kerfings). Savouring it with all the senses... When was the last time You picked up a fine instrument and savoured its fine details and aspects? The saddle slot is cut (maybe a picture of the fixture later). The armrest is made of rosewood and redwood. We'll see if it will find it's way to the final product. 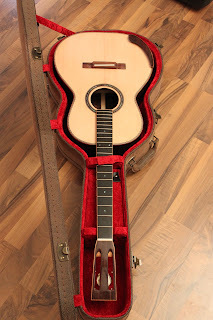 The logo in the case says "Thomann". Otherwise the case is sturdy and ok.